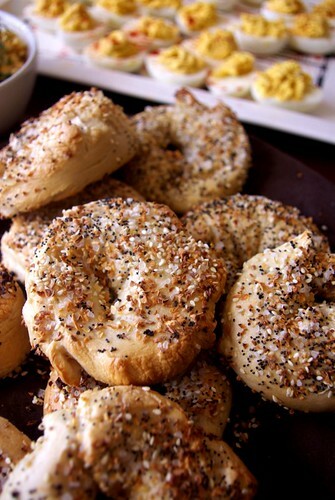 sea salted everything bagels done right, originally uploaded by aarn! +14th April, 2009+. mixed together 1c. plus 2T. warm water, 2 1/4t. active dry yeast, and 2 1/2t. sugar, and let sit for 5 minutes or so. stirred into the wet mixture 1T. melted vegetable shortening, 1 1/2t. sugar, and 1 3/4t. salt, and then slowly added 4c. of all-purpose flour, one cup at a time as it mixed. kneaded by hand for 10-minutes, then placed in a warm spot to prove for an hour (covered with plastic wrap to avoid crusting). after the dough had doubled in size, it was punched down and formed into a large log, allowed to let sit for a minute, then divided into 8-10 pieces which were rolled into logs and then pinched together at the ends with a smear of water, forming the bagel shape. it just happened that the bagels were allowed to rise for an additional 30-minutes as they waited to be poached, this couldn't have hurt. in a large pot, 4-quarts of water, 1T. sugar, and 1/2t. salt were brought to a boil. four at a time the raw bagels were poached in the bath for about 30-seconds per side, allowed to drip off the excess water for a few seconds with a skimmer spoon, then placed on a baking sheet lined with parchment paper, and seasoned while still wet. the seasoning was a dry mixture of spices from christina's in inman square: blue poppy seeds, garlic flakes, onion flakes, sesame seeds, and sea salt. the bagels were then baked in a 425-degree oven for about 18-minutes, rotating the tray at about 10-minutes to allow for a more uniformed color and texture. the bagels were served warm with fresh churned butter, red onions, capers, smoked salmon, egg salad, and whipped cream cheese. I want one of those bagels! My mouth is watering. The chives just came up in the yard and I was thinking of adding them to cream cheese and spreading it on a bagel just yesterday! I love your mom! Gotta give credit where credit is due, bro, especially to the moma's! Your food looks very well done, just discovered your blog, looking forward to reading through, thanks!